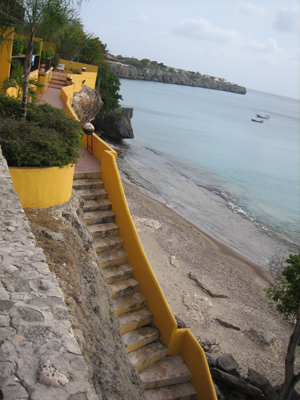 Curacao is an island located just off the Venezuelan coast in the Southern Caribbean. 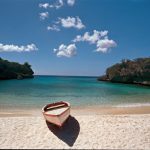 It is part of the group of islands known as the Netherlands Antilles, as is sister island Bonaire, just 40 miles away. Also nearby is Aruba. 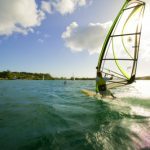 In fact, the three islands together are known as the “ABC Islands” of the Lesser Antilles. 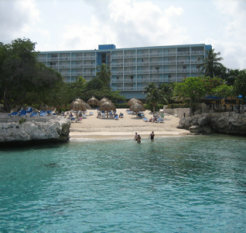 Of the three, Curacao is the largest and most populous. 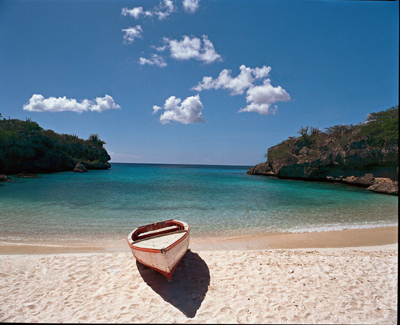 Curacao offers over 60 dive sites, most of them accessible from shore. The island is bordered by 80 miles of pristine coral reef, which drops off steeply within a few hundred feet of shore. There’s a little something for everyone here…reef dives, wall dives, cave dives, even wreck dives. 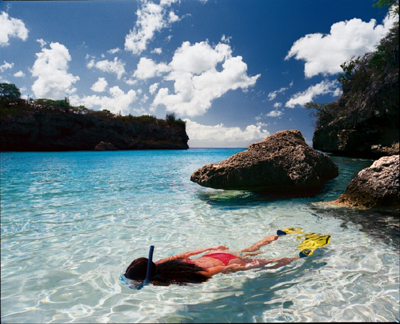 Snorkelers too will enjoy easy access to many stunning sites. Expect an abundance of hard corals, gorgonians, sponges, seahorses, eels, sea turtles, dolphins, and an amazing variety of tropical fish. 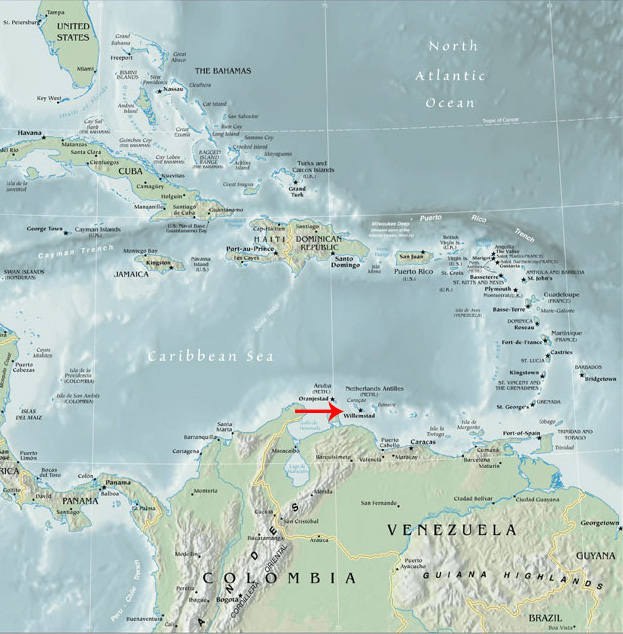 Because the Southern Caribbean enjoys an arid climate with little rainfall, water temperatures range from 78-84 degrees and visibility usually ranges from 100-150 ft! 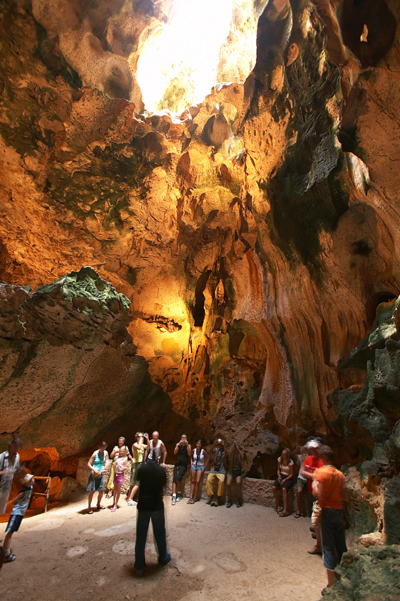 Curacao is culturally and historically rich. 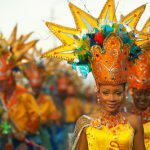 From its Dutch Colonial architecture with a Caribbean flair, to its popular yearly Carnival, it offers a delightful mix of Old World charm and contemporary culture. 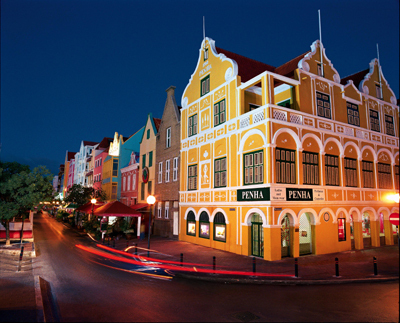 Take a little time to experience the lively city of Willemstad. It’ll be a great way to round out your vacation. Ocean Encounters at Hilton Curacao is a full service dive facility located adjacent to the Hilton dock. The dive operation offers daily two-tank and one-tank boat dives, daily afternoon snorkel trips, unlimited shore diving, full equipment rental, kayak rental, secure storage areas and a retail shop for all those last minute needs. Ocean Encounters Curacao is an internationally recognized and award-winning Gold Palm Five Star IDC PADI National Geographic dive center. The headquarters of this family-owned & operated dive center is located on the grounds of the Lions Dive and Beach Resort. 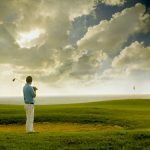 At the well-stocked retail shop, you will find scuba diving and snorkel gear, dive computers and watches, wetsuits, rash guards, and a collection of clothing from baby shirts to hats and large tees. Certified technicians inspect and maintain all scuba diving rental gear in their own full service repair facility. In order to maintain quality and perfect working condition all rental gear is changed out every 18 months. There are about 400 scuba diving tanks in service at Ocean Encounters. All tanks are hydrostatically tested every five years and visually inspected every year. Nitrox is readily available. Quarterly air quality testing ensures that cleanliness and safety are not compromised. 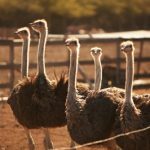 Ocean Encounters will take you to ALL of Curacao, from the famous Tugboat to the exciting wreck of the Superior Producer, Mushroom Forest, Watamula, and the island of Klein Curacao. Courses are offered from Discover Scuba Diving to Instructor, Emergency First Response and Tech Diving. Ocean Encounters at Breezes Curacao is a 5 Star IDC dive facility located right on the water’s edge with a huge shaded deck and a two tier dock. 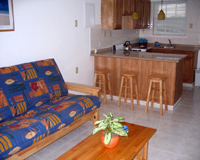 Your vacation with Ocean Encounters Breezes is made effortless with equipment lockers on the deck, a freshwater shower and rinse tank on the dock, and easy access to one of the best house reefs on the island. A fleet of dive boats provides daily two-tank morning boat dives and afternoon one-tank boat dive/snorkel trips. The regular weekly schedule includes visits to dive sites from one end of the island to the other, including special trips to Mushroom Forest, Klein Curacao and East Point! As a Five Star IDC dive facility, Ocean Encounters provides a wide selection of scuba courses from beginner to instructor, including specialty courses such as Nitrox, Deep Diving, Wreck Diving & Underwater Photography. Coral reef awareness courses through Project Aware and Beautiful Oceans are also offered. GO WEST Diving, a PADI 5-Star Instructor Development (IDC) Dive Operation, is located at Sandton Kura Hulanda Lodge & Beach Club on the West End of Curacao. 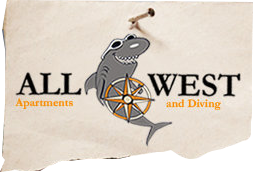 With a satellite shop at nearby All West Apartments, the dive operation is equipped to provide diving services to the entire Westpunt area. The dive center offers the full range of PADI courses (up to IDC Staff Instructor), as well as quality equipment rental, a locker room, a retail shop, rinse tanks and an air/nitrox filling station. A fleet of 2 boats offers daily 2-tank morning boat dives to the best selection of sites based on a weekly schedule. 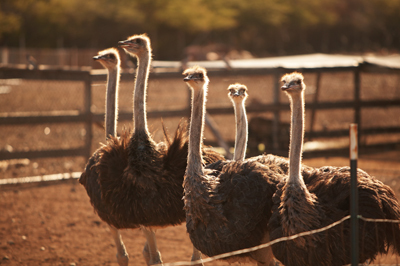 Naturally the spectacular Watamula and Mushroom Forest are at the top of the list. Morning dives leave at 8:30 am and return around 12:30 pm. Afternoon one-tank boat dives depart at 2:00 pm and return around 4:00 pm. 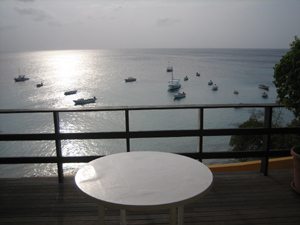 The house reef is also the number 3 dive site on Curacao’s drive and dive map. “Alice in Wonderland” is a fantastic coral reef, just a few steps and kicks from the PADI dive center. 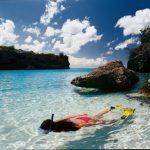 Most of Curaçao’s top dive sites are only a few minutes away from GO WEST Diving by boat or car, although trips to the further sites like Superior Producer, Tugboat & Klein Curacao are also regularly arranged. 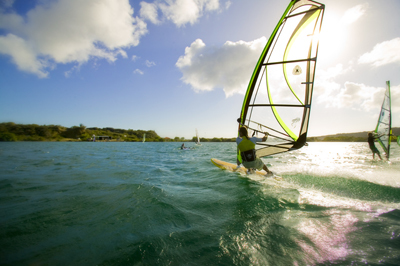 Nitrox, kayaks, dive yaks, paddle-boats and twice-weekly snorkel trips are also available. This site is located off the northwest coast of the island and is named for the large star and boulder coral heads that have eroded at their bases and now look like giant mushrooms. You’ll see turtles, porcupinefish, trunkfish, lobster, parrotfish, eels, jacks, barracudas, and tropical fish galore! 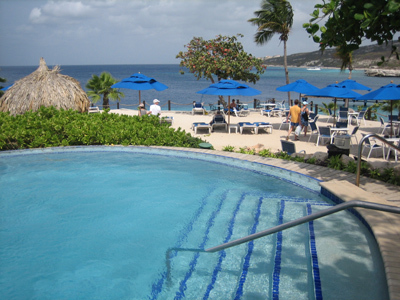 Consistently ranked as one of the top dive sites in Curacao. Accessible by boat only. Another northwest dive site that is mostly done as a boat dive. The gently sloping wall features sea fans, gorgonians, sea plumes, sea whips, sponges, anemones, and a plethora of hard corals. Look for snappers, jacks, triggerfish, sea turtles, green morays, and eagle rays. Currents are often strong here, setting the stage for excellent drift diving. This 30 foot wreck is just a few feet offshore in 15-20 feet of water. It is covered in tube sponges and brain corals and houses eels, schooling tropicals, trumpetfish, turtles, angels, and seahorses. Great snorkeling spot! Located nearby is a wall that drops off to about 100 ft. Here you’ll see hard and soft corals, morays, scorpionfish, and lobsters. This impressive wreck, covered in orange cup corals and sponges, has been rated by Sport Diver Magazine as one of the best wreck dives in the Caribbean! Explore the bridge, wheelhouse, and holds while looking for snapper, barracuda, mackerel, grouper, and silversides. Requires intermediate to advanced skill. This site, accessible by boat or from shore, features a double reef system with tons of nooks & crannies to explore. You’ll likely see angelfish, parrotfish, eels, lobster, seahorses, mantis shrimp, flamingo tongues, schools of goatfish and grunts, and maybe even eagle rays and turtles. 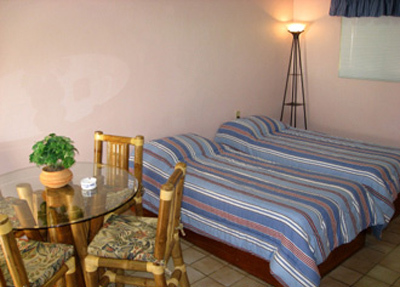 All West Apartments is located at Playa Piskado in the small fishing village of Westpunt. Each of the 3 Studios, 5 Junior Apartments and 4 Apartments offers a private terrace or balcony with a truly mesmerizing sea view. The 3 All West Studios (right) feature two twin beds, inside and outside seating, sun beds, fully equipped kitchen, bathroom with shower, air-conditioning, safe, phone & free wireless internet. The 5 All West Junior Apartments (left) feature one bedroom with two twin beds, living room with full size futon, bathroom with shower, fully equipped kitchen, outside seating area, sun beds, safe, phone, air-conditioning & free wireless internet. The 4 All West Apartments (right) feature one bedroom with a king size bed, living room with queen size sleeping couch, outside seating area, sun beds, fully equipped kitchen, bathroom with shower, safe, phone, air-conditioning & free wireless internet. 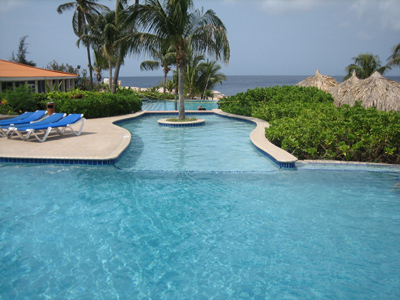 Hilton Curacao is located just 4 miles from Willemstad and 10 minutes from Hato International Airport. 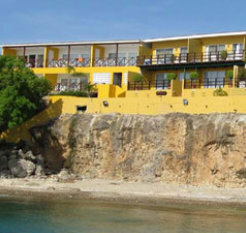 Set on the shores of Piscadera Bay, the 196-room resort features two private white sand beaches and lush landscaping. The resort’s location gives visitors the convenience of a major city, while the tranquil setting, accommodations & amenities lend the air of a truly tropical resort. 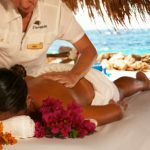 From a full-service spa to an on-site dive center, everything guests need to relax and recreate is theirs for the asking. 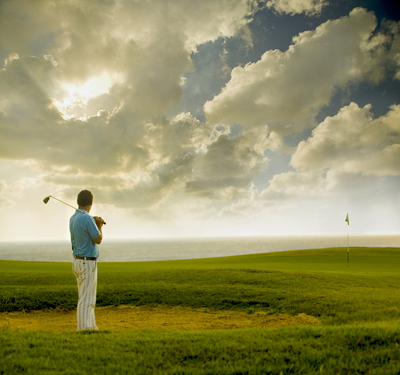 Here, Hilton’s custom of extraordinary hospitality is enhanced by rich island traditions and local culture. 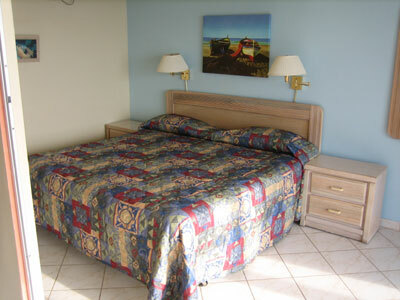 Standard Rooms feature beautiful island views, tasteful décor and furnishings and a balcony. 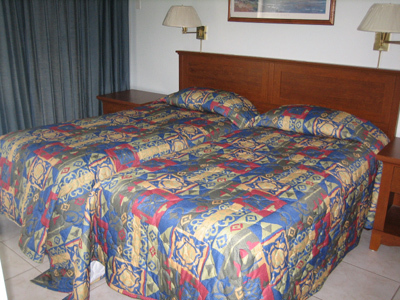 All rooms have a king or two double beds, as well as the standard amenities you would expect such as a coffee machine, in room safe and iron & ironing board. 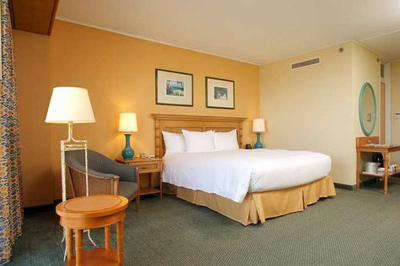 Standard Plus Rooms have the same amenities, plus a partial ocean view. 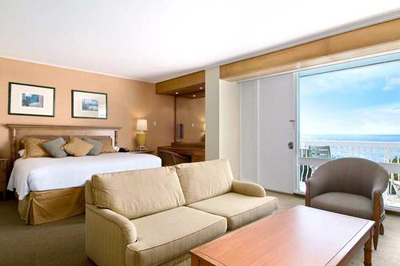 Deluxe Rooms have a balcony featuring a stunning full ocean view, a king or two queen beds, and the standard amenities above. There are 2 Suites and 10 Junior Suites (right) at the hotel, all with stunning views as well as more space for those who want to pamper themselves just a little more. Also available is the Executive Floor, boasting 34 renovated hotel rooms and 3 suites, which all include access to the Executive Lounge. All Executive Rooms & Suites offer high speed internet access, large working desk, mini bar, alarm clock with MP3 connection, bathrobe and slippers, in-room coffeemaker, complimentary bottled water and daily turndown service. 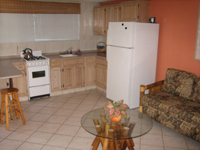 The resort offers a wide array of dining options. 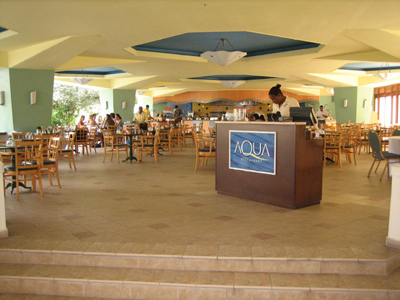 The property’s main restaurant, Aqua, serves local specialty dishes for breakfast, lunch and dinner. Cielo, serves Italian fare in an elegant outdoor setting. For those on the go who may want a light bite, Parasasa Café is open for lunch, drinks & snacks. The Beach Bar & Grill serves lunch and refreshing drinks, while Captain Bligh’s Bar offers cocktails, beer from the in-house brewery and light snacks. The free form infinity swimming pool offers the utmost in seclusion and relaxation. A children’s pool is also available. This charming restaurant is located on the grounds of the Hotel Kura Hulanda Spa & Casino in Willemstad. It is named for the impressive collection of astrolabs on display nearby. Enjoy fine Continental cuisine either in the air-conditioned dining room or beneath the canopy of a massive ficus tree on the outdoor terrace. Offerings include pumpkin-cream soup with ground nutmeg, roasted reef lobster with a lemon confit, and a delicious seafood stew. Service can be quite slow, so be prepared to relax and enjoy the excellent wine list. Reservations recommended. Closed on Mondays. This romantic restaurant is built into the island’s oldest fort, in an enviable position above the sea. Specializing in authentic Italian cuisine, the menu features homemade pastas and pizza, as well as fresh lobster dishes. 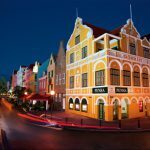 This restaurant & bar, built into the ruins of an 18th-century fort overlooking Willemstad, boasts an amazing 360 degree view that alone is worth the visit. But while you’re there, you may as well sample the International menu which features fresh seafood, juicy steak, and more. Be sure to make reservations. Eclectic cuisine, a martini menu, Cuban cigars, and a club-like atmosphere combine to create a popular hot-spot. Closed on Sundays. Go snorkeling…most dive sites are accessible from shore, making this a snorkeler’s paradise! 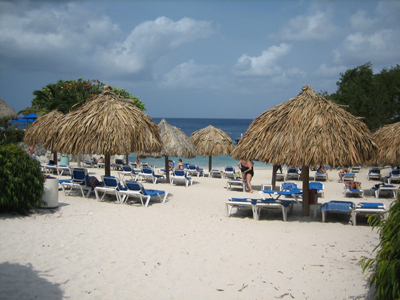 Curacao, and its sister island Bonaire, are located just off the Venezuelan coast in the Southern Caribbean. Also nearby is the island of Aruba. A non-stop flight from Miami takes 2 1/2 hours. A flight from Caracas, Venezuela takes 45 minutes. Total flight time will obviously depend on your departure city and connecting flights. 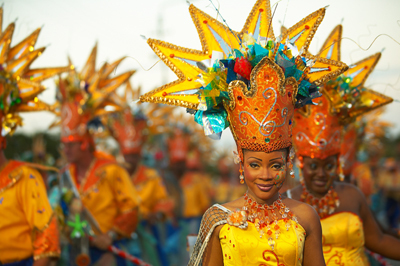 The official language is Dutch, although English, Spanish, and Papiamentu are also widely spoken. 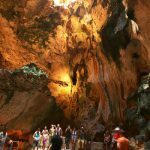 Yes, you will need a valid passport to enter Curacao, as well as to re-enter the US. 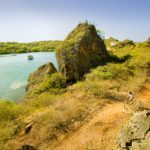 Visitors to the Netherlands Antilles may be asked to show onward/return tickets and proof of sufficient funds for their stay. Length of stay is granted for 14-30 days and may be extended for up to 90 days by the head office of immigration. Always check www.travel.state.gov before traveling for the most current information. For legal reasons, we cannot make official recommendations regarding shots and immunizations. Please consult with your physician or visit www.cdc.gov for more information. 127 V, 50 Hz. US appliances will work, but may run hotter, and devices with internal time mechanisms will not keep the correct time. Please check with your airline for luggage requirements and restrictions. Yes, unless otherwise specified, we will arrange for your transfers to and from the airport. While the water is warm enough to go without, we recommend divers wear a 3mm wetsuit for protection. Most dive sites are within a 15-20 minute boat ride of the resorts, and many are alternately accessible by shore. What's a typical dive day like? Most dive operators offer a two-tank morning dive, followed by an afternoon dive. Late afternoon and night dives are typically scheduled once a week. 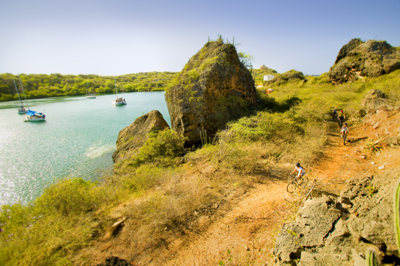 Dolphin dives and special trips to Klein Curacao or Mushroom Forest are typically scheduled 2-3 times a week.